As you know I recently received a lovely box of goodies for the team at Huon Aquaculture to partake in their Huon Blogger Challenge. The Huon Blogger Challanage brings together 30 Australian Food Bloggers with the challenge for them to create and post a versatile, year-round recipe using Huon Reserve Selection. Lucky me!! Which I sat pondering (and I won’t lie munching on some delicious salmon straight from the packet) I got to thinking about rice paper rolls – this healthy snack is the perfect weekend treat, fresh weeknight dinner, stylish finger food for guests or great for the kid’s lunch-boxes as an exciting alternative sandwiches. It’s also helpful to have a quick and delicious finger food recipe up your sleeve for when unexpected friends and family do the much feared ‘drop-in’. With Australia’s mild winters and the current craze of Vietnamese cuisine a refreshing rice paper is always a crowd pleaser. So plate up this bad boy and you’ve got yourself a little celebration on a plate! Fill a large flat bowl with hot water, I like to use my quiche dish, and place the rice paper wrappers in the water one at a time for about 30 seconds or until soft and pliable. Don’t leave for too long or the wrapper may tear. Place rice paper wrapper on a damp tea towel – the dampness is essential so the wrapper doesn’t stick. Top alternating wrapper with Huon Reserve Selection Hot Smoked Ocean Trout and 3 of the prawn halves. Top with coriander and add a little of the cucumber, carrot, avocado and a sprig of green shallot. Fold in sides, one end and roll up firmly to enclose filling. 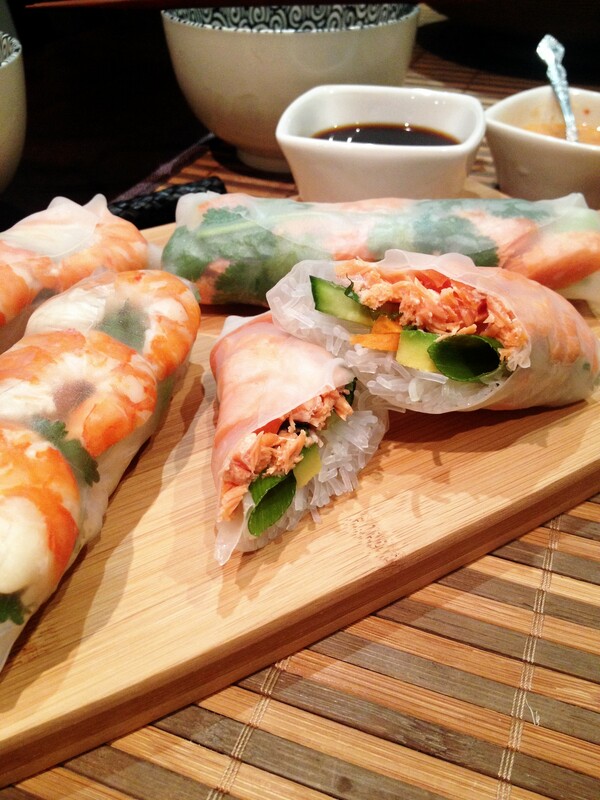 Place onto a plate and loosely cover with a another damp tea towel, repeat to make 10 rice-paper rolls. Meanwhile, to make the Thai Style Peanut Dipping Sauce add all ingredients to a small sauce dish and mix until well combined. Place rice paper rolls onto a large serving plate and serve with Thai Style Peanut Dipping Sauce.